What’s the biggest thing you’ve ever lost? Your car keys? Your actual car? Maybe you’ve misplaced a book, or an item of clothing. Well, don’t feel too bad about it. Around the turn of the century, the Pennsylvania State government managed to lose something sixty feet tall. Three somethings, in fact. And the ones they didn’t lose ended up in the Pennsylvania Wilds. This crossed my mind recently when I got the email inviting me to the Creative Makers of the PA Wilds exhibit, which is planned for March 27 at 1 PM at the Capitol building in Harrisburg. The Capitol, which is not within the PA Wilds, still has connections here, and a mystery surrounds one of them. The Capitol building that the event will be held in is not the first one. There was a building that was built in 1820, and it burned down on February 2, 1897. Afterward, it was rebuilt. The original building, before the fire, had six stone columns on the front. They were huge, sixty feet tall. Over time, three of them were moved to the Pennsylvania Wilds, along the region’s I-80 Frontier and the southern end of the Pine Creek Valley & PA Grand Canyon landscape. The first one was moved to McElhattan, in Clinton County, in 1898. It was erected as a soldier’s monument in Linnwood Cemetery, and inscribed with the names of soldiers from seven different wars. It can be found with a drive down Linnwood Avenue in McElhattan, and is easily seen from the road. The next one was set up in 1900, and is on private property in Antes Fort, Lycoming County. It was established as a monument to King Wi-Daagh, a Native American leader who made a land deal with William Penn. His story is mentioned in Henry Wharton Shoemaker’s book Tales of the Bald Eagle Mountains. According to the legend, Wi-Daagh’s home was near where the monument now stands, and his ghost still haunts the area. If you encounter the ghost, you will feel an irresistible compulsion to return to the spot in one year. Pictured, at right, is Lou Bernard beside the capitol column now located in Antes Fort. The third column is also in Lycoming County, in the Jersey Shore Cemetery. It has stood since 1907, towering over the cemetery with a sculpture of a soldier on top. The cemetery is along Locust Street, and almost the second you get inside, you can spot the monument. It reads: Erected December 20 1907 by the Citizens of Jersey Shore and vicinity to the memory of the soldiers and sailors of the Revolutionary War, War with England 1812-1814, Mexican War of 1846-1848, Civil War of 1861-1865, and of the Spanish American War of 1898. 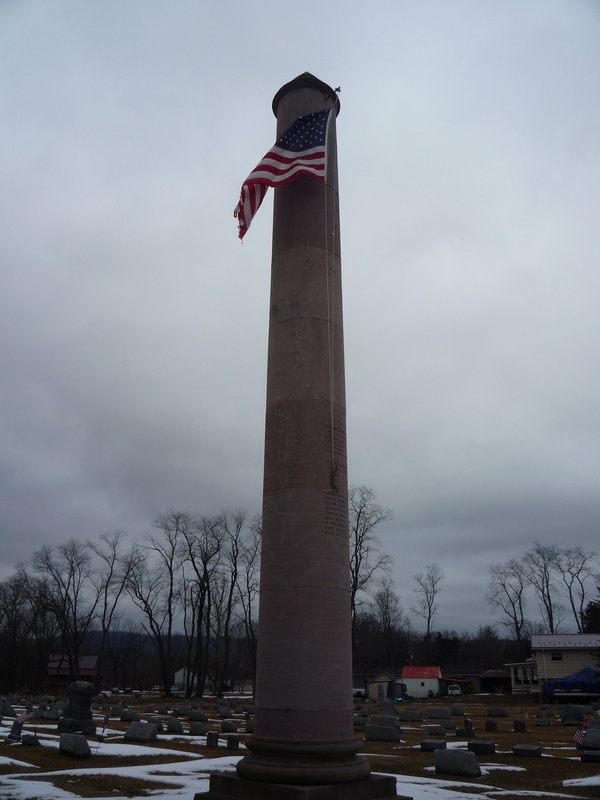 This column is from the State Capitol, erected in 1819-1920, and destroyed by fire February 2, 1897. “We here richly resolve that these dead shall not have died in vain, that this nation, under God, shall have a new birth of freedom and that this government of the people, by the people, for the people, shall not perish from the Earth.” Lincoln. 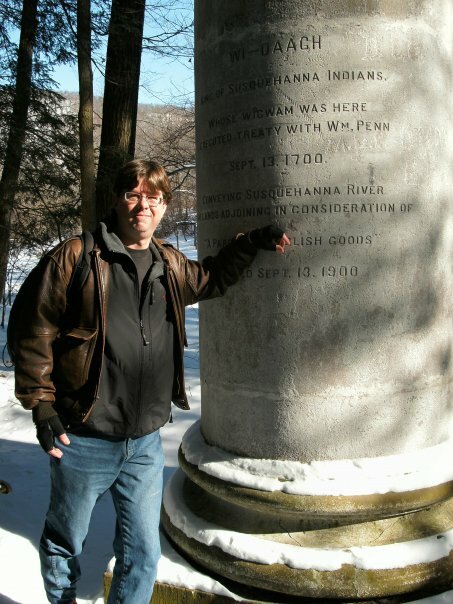 As mentioned, there were six columns, and three were moved to the Pennsylvania Wilds. In spite of my terrible math skills, even I can tell that leaves three columns unaccounted for. They’ve never turned up. There is no record of what happened to them. People from the state government have tried to find out, and discovered nothing. Losing three giant stone columns has to be difficult to do, but somehow it’s happened. One explanation is that they might have been moved somewhere, used as monuments, and forgotten. This is more common than you might think; Pennsylvania is full of buildings and statues of dubious origins. 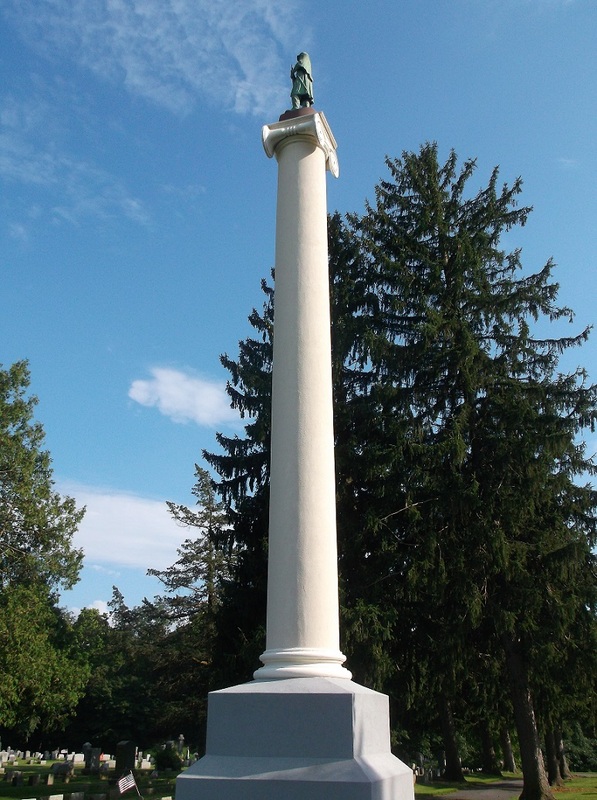 If you happen to be driving through Pennsylvania and notice a tall, cylindrical monument that seems to be unaccounted for, please, let me know. Another possible explanation is that they were too damaged to move and were dumped off the side of City Island, into the Susquehanna River. They may be lying on the bottom of the river right now, and if I were a better swimmer and immune to poison ivy, I would definitely go and check. As people walk into the Pennsylvania State Capitol, they may not realize they’re walking through history, a story that connects to two counties in the Pennsylvania Wilds region, a Henry Shoemaker story, a ghost, and a century-old mystery. Lou Bernard is a freelance writer, historian, explorer, outdoor enthusiast, and paranormal investigator. A resident of Clinton County, Lou is a staff member at the Annie Halenbake Ross Library. He is a member of the Lock Haven Paranormal Seekers, and investigates old legends and stories from the past.